This small town offers visitors an extensive monumental heritage and the chance to experience one of the most exciting chapters in world history: the colonisation of America. Standing on a rocky mass, Trujillo was already well known in Roman times under the name of Turgalium. It became a tax prefecture of Augusta Emerita (present-day Mérida). The Moors replaced the Visigoths, thus initiating a period of splendour in which the town's walls were built. In spite of the attempts made by Alfonso VIII, the town was not recovered for Christendom until Ferdinand III did so in 1232. 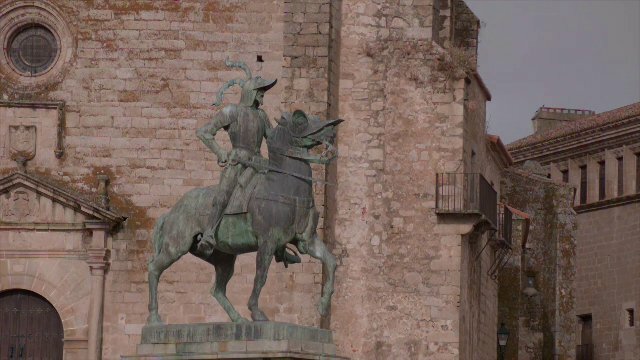 Trujillo achieved its greatest prosperity in the 15th and 16th centuries, during which a start was made on numerous civil and religious buildings. As a result of its newly found wealth, the town developed and spread out beyond its walls during that period. After climbing up to the Castle, standing at the highest point of the town, from where you have magnificent views, you can lose yourself in the town's streets. Once inside the walled enclosure, the Chapel of San Pablo ( 16th century) and the four gates remaining of the original seven are well worth a look, as are the Alberca - a water deposit hewn of solid rock - and a Hispanic-Moorish water cistern. From there, carry on to the Church of Santiago, a 12th-century Romanesque building, subsequently restored in the 17th century, where the sculpted, wooden figure of the Christ of the Waters is housed. Continuing on your way you will come to Plaza Mayor, in the heart of the town centre. Renaissance in style, this porticoed square is presided over by the equestrian statue of Francisco Pizarro. Traders and artisans gathered there until the homes of the most important noble families were built there in the 16th century, such as the House of La Cadena, that of the Orellana, or that of the Chaves-Cárdenas. Also worthy of note is the Palacio de la Conquista, which was started by Hernando Pizarro, brother of the discoverer, and which has an outstanding balcony; the Palacio de los duques de San Carlos, the Palacio de Piedras Albas or the Palacio de los Carvajal-Vargas with its corner balcony and its chimneys. You also have the Church of San Martín de Tours and the Church of Santa María la Mayor nearby. The latter is one of the most important religious monuments in the area owing to its age - the Julia Tower dates from the 13th century - and its unmistakeable architecture, which bears the marks of the restoration work carried out in the 14th and 16th century. These are just a taste of the most outstanding treasures to be found in this noble town. Rambling among them you'll discover even more charming spots and legends. Likewise, you will no doubt fall under the spell of its hospitable inhabitants, Trujillo's greatest treasure, and its gastronomic delights (such as the "frite de cabrito" (stewed kid), "moraga" (charcoal-grilled pork) and the "sopa de obispo", literally 'bishop's soup', which consists of a broth containing small pieces of chicken, beef, bacon and boiled egg), all of which is further enhanced by the warm and friendly atmosphere. In addition, we must not forget important events such as Holy Week or Trujillo National Cheese Festival. More information: Trujillo tourist office.